Marios eyes widened, sounds faded; he pointed 10 years and nearly $100,000 of street muscle onto the pad. As the camaro spat and thumped the crowd roared in anticipation. There was no need for anything as crass as side-footing the clutch, he gently eased some power from the near-500 cubic inches of angle iron and without hesitation those fat Mickey Thompsons gave up their grip on the tarmac. Climbing through the gears, the chev was raw, angry, untamed; a Rootes blower jammed the high octane mix into the chambers where the ensuing spark forced pistons, rods and crank to twist faster and faster in a self fulfilling prophesy. In top, tacho in the red, speedo off the scale, the crowd got to their feet and howled for more. Mario heard nothing; he was in the grips of redline fever, the whites clearly showing in his eyes. He was gone; lost in the moment. 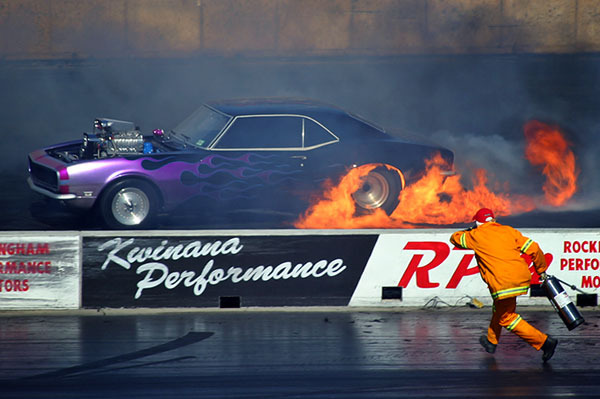 With the rubber near depleted, heat and sparks combined with the excessively rich exhaust inevitably caught alight. Walter, the firey, sprang into life, grabbed the nearest extinguisher, shielding his eyes ran towards the fire still being fuelled by that big shiny engine. "Wal," his mates called, "that extinguisher ain't gunna do sh*t."